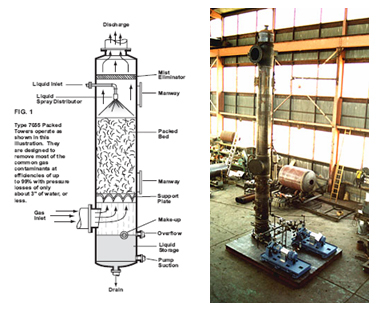 Packed Tower Gas Scrubbers are designed to remove most of the common gas contaminants at very high efficiencies (up to and beyond 99%) with low pressure losses. Packed Tower Gas Scrubbers are available in standard sizes, but can also be specially designed or modified to fit unusual service conditions. When desired, S&K can supply a complete, packaged system including fan, recycling pump, and liquid storage for recycling.